Whether we love it or hate it, money is a necessity and the better we manage it the better we find life to be. Setting money goals is no different to setting other goals say around losing weight, starting to exercise and eat healthier or getting a new job for example, but because we generally tend to think about money differently, we don’t always achieve our money goals. Often the thoughts we have around money affect how we behave with it – why otherwise do some people have lots of it and others don’t. Although you could say it is about how much you earn, what you do with it once you have it is what’s important – so what this means is that it wouldn’t matter how much you had if you always end up with none…it might take you longer but you would still end up in the same situation. We have to change how we think about money before we can change how we manage it. Setting one or two goals is better than setting lots. So although you might have lots of things you want when it comes to money, setting a couple of goals means you are more likely to achieve them than setting yourself lots and becoming overwhelmed. Start small – if you haven’t been great with money in the past that doesn’t mean you can start now – and pat yourself on the back for wanting to start now and set yourself some money goals for 2017! Like anything things start to snowball, so when you have achieved your first small money goal you will have lots of confidence to move on and set more goals. Taking actions in smaller steps are also easier to deal with – that’s why people always learn easier in smaller chunks too! We can deal with small steps but when we have much larger ones it becomes overwhelming and we can easily talk ourselves out of it. Work out how much money I owe. There may be other actions you have too but the goal is simply to achieve a budget – so you know how much you have coming in, what is going out and to where and how much you have left. You could then move on to your next goal which might be to make a plan for paying off your debt. If you have a lot of debt that might take some time – it doesn’t matter how long it takes, the fact that you are working towards it means you will achieve it. Don’t forget, you don’t have to do this alone. There are lots of organisations out there who can offer free advice and help you with paying off debt. Work out your debt in the same way that you worked out the budget by putting the overall goal, which would be to create a ‘Paying off Debt’ and then list the actions you need to take to do that. You can also set timescales for each action. So using our example of working out a budget, you might set yourself an action step each week. Something else that really works and this is used by people who manage army operations so it definitely works, is to work backwards. So if your goal is to pay off your debt you start with that goal as your end result and then work backwards. So think to yourself it is February 2018 (or when you would like that goal to be achieved by) and I have paid off my debt and then work backwards taking all the action steps you would need to take to get there – you then have a list of things to do that lead you back to now…. You might have read the Aesops Fable story about the Hare and Tortoise – racing off doesn’t always mean you will finish first and in that story the tortoise won the race by plodding along. The point here is to keep moving – take small steps towards your goal but keep going forwards and you will achieve it. Once you have achieved one goal it makes it much easier to achieve another and another and before you realise it you will be one of those people that others look at and say, he/she is great at managing their money, I wish I could be like that. You have everything you need right now to start managing your money better – set the intention (the goal), write down the actions (the steps) and start taking them! Good luck and we hope that 2017 brings lots of good things for you around money and managing it better! Tags: better money management, how to manage your money better, how to set yourself money goals for 2017, money advice service, money goals for 2017, and setting financial goals. Although we can make mistakes around money at any age there are specific financial mistakes people make at different ages, generally through their 20’s, 30’s and 40’s. We thought you might find it a useful read. When we are young it can be easy to get carried out with the latest gadget or high end luxury products that we really can’t afford but must have. Whilst we are all for treating yourself, it’s important to sit down and decide whether you can really afford the high expense. This carries on from the first point. If you are spending too much on high priced goods, there may not be enough left over for saving. Sometimes even if there is, people in their 20’s don’t often see the benefit of saving, much preferring to be in the moment with their money. Having an emergency pot of savings means that whatever comes your way, you have money put aside should you need it. Putting away just a small amount each week or month will help build up an emergency savings fund. If we had a pot of money for every time we have heard, ‘when I am 18…’ well we would be quite wealthy by now. When people hit late teens and early twenties they often decide it’s time to move out, even if they can’t really afford it. Living with parents isn’t cool and so people in their twenties often move out into accommodation with others or on their own that is way out of their affordability range. It can also be difficult to manage balancing bills and other household payments. Whilst living at home might not be the best solution, it certainly can be financially for a while. Even if you are paying money towards the household, you will have much more left over for yourself and to save than if you were to move out and be fully responsible for bills. Keeping up with the Jones’ is something that is more common in the 30s than any other age. Having survived the 20s it can often seem like the right thing to do, upgrading our house or car. This seems more common when we have had children and the house seems to be overflowing with ‘stuff’. Even those who haven’t had children find that in their 30s there is a burning desire to just go bigger. Chances are if you have had your existing home for a while you will have built up some equity in it. Rather than being hasty and moving to somewhere bigger, why not think of other ways you can create more space. It is surprising just how much clutter we acquire over the years. Still want to move? Set yourself a 3 or 5 year plan and work on saving some more money towards it. That way when you do move you will have some money behind you. Similarly, with cars it is easy to get something more luxurious and beyond what you could truly afford if you bought it outright. Lease and finance car options mean that there is always a better option available, but be sure you can afford the maintenance and that your mileage is covered. Sometimes buying a car yourself that is perhaps less of a luxury will be better in the long term. When you own the car yourself you also have the value in that if you do wish to change it. Leasing or financing often means you are paying for something you will never own and may end up having a bill at the end of it. Be sure to read all the fine print before you commit to anything. Once you get into having your own place, getting married and having children it can be easy to borrow money. Although having access to affordable credit is part of good money management, it doesn’t mean you have to run up debt beyond what you can afford to pay back. It is always better to keep borrowing to a minimum and pay things off before taking something else on. If you do find yourself in debt (at any age!) don’t bury your head in the sand, it will only make the situation worse. Seek help and advice because there is always a way to work it out. This will depend on the type of person you are and how you think about money generally. We can’t always assume we will have money in the future and so it is always worth having something set up for a rainy day and longer term for retirement. There are lots of options that you can look into and often employers provide a pension plan you can join. A lack of cash flow means that if the washing machine breaks down or the fridge breaks you might seek a loan from a high cost lender, just to get cash quick. Sometimes it doesn’t even need to be an emergency that means borrowing extra either. If you are living beyond your means or not having enough cash to cover day to day expenses, it might be time to assess your finances and give them a good MOT! Having enough cash flow means being able to save a pot of money for when you need it too. There are lots of budgeting tools online and ways you can cut back on spending. Sometimes we save for short term things like holidays or cars but it is always a good idea to have a pot of money saved for long term. This isn’t about paying for emergencies, but just saving money so you have something put by for later in life or when you are unable to work as much as perhaps you do now. Dipping into these savings can mean just a bit here and there with the promise of putting it back, but most often times we don’t. Try to avoid dipping into your savings and instead having a pot of money that you just use for short term things. If your longer term savings are in a higher interest account you are also losing money by taking it out! Lots of people have them! It’s not always about having a sporty car (although sometimes it is). Forties do funny things to people when it comes to money. Whether that is booking an extravagant cruise, going crazy with buying a bigger home, redoing the house or a whole host of other expensive treats. Question your spending when you are in your forties. Although you are some way off to being at retirement age, it is worth being wise with your money. If you are spending extravagantly make sure you can afford it first and rather than making hasty decisions, give yourself time to think about them. Truly we could apply many of these money mistakes to any age. If any seem relevant to you, take some time to figure out what you have coming in, going out and what you can save. Work out a savings plan, so not just short term saving but an emergency fund and long term saving too. If you get a pot of money built up you might also want to get advice on investing. Whatever your financial situation just know there are always options for you both in saving and borrowing and lots of good advice out there to help you. Tags: better money management, financial mistakes people make at different ages, manage your money better, mistakes people make with money, money mistakes in your forties, money mistakes in your thirties, and money mistakes in your twenties. Despite the weather at times, it is the middle of summer, so saving for Christmas might seem a little crazy to think about at the moment. However, most people can all relate to feeling a little panicked towards the end of November. This is when they realise there is just a month left until Christmas and maybe one or two paydays in between. There is always so much to buy; presents, food and not to mention the parties and never ending get-togethers. Worrying about money can take the fun and enjoyment out of Christmas. Planning early is actually a really good idea and with less than 6 months until December, now is the time to start. Studies show that tracking your money while you save is a good way of figuring out where your money actually goes. You might think you spend it all on food or the kids, but chances are you can’t account for all of it. Download one of the free spending tracker apps from your iPhone or Android app store and start logging your spending. Once you get clear on what you are spending your money on, you’ll find you want to make a few changes and may be able to save a little bit more. For now, though, just decide on an amount to put by each week and start this week! Don’t be tempted to put it off. There will always be next week, but this just lets another week slip by. Before you know it, the summer will have gone, we will be into autumn and you’ve not saved anything. Do it this week and make a commitment to yourself to save a little every week. After all, you are going to be thanking yourself for it in December when you can afford to buy Christmas presents and food without worry. Why not make it something fun for the family and get your kids involved in saving too. Children always like to buy their family or friends a little present for Christmas. As well as getting them excited about being able to do this, it is also teaching them about managing their money and saving. As they grow up they will remember what you taught them about money and it will carry on into their adult lives and help them too. People find that by transferring money to their Nottingham Credit Union account, or having the money paid in there, makes it easier to save. When your savings are separate from your bank account it removes that temptation to dip into the money. Even better, we offer a Christmas Savings Club that just ring fences that money for Christmas only. 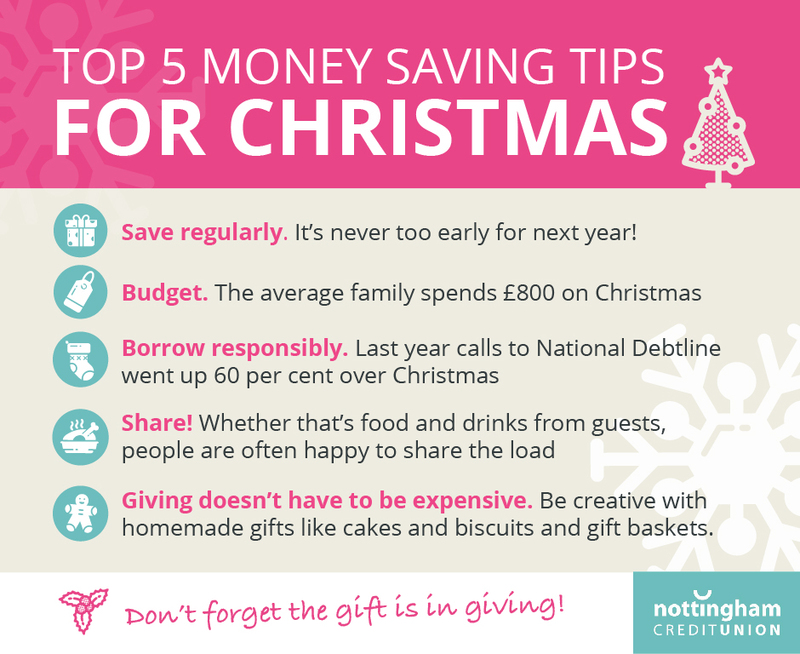 This means if you do have money in your regular NCU account, the Christmas money can remain separate. With our Junior Savers account, setting things up for your kids to save too couldn’t be easier. Contact a member of our team today and get everything set up and start saving for Christmas today. Tags: benefits of saving, better money management, christmas savings, christmas savings club, junior savers, and spending tracker.